A new study shows that gay, lesbian, and bisexual teens have a higher risk of binge-eating and purging than their heterosexual counterparts, perhaps because of social isolation. Previous studies have shown that gay men were at higher risk of eating disorders than straight ones, but this is one of the first studies to look at gay teens. Interestingly, the study divided its population into homosexual, bisexual, "mostly heterosexual," and heterosexual groups, showing a little more acceptance of orientation fluidity than one might expect from mainstream science. Lead researcher S. Bryn Austin and her colleagues found that lesbian, bisexual, and mostly heterosexual girls were about twice as likely as heterosexual ones to report binge-eating. Bisexual and mostly heterosexual girls (though apparently not lesbians) were also more likely to purge. 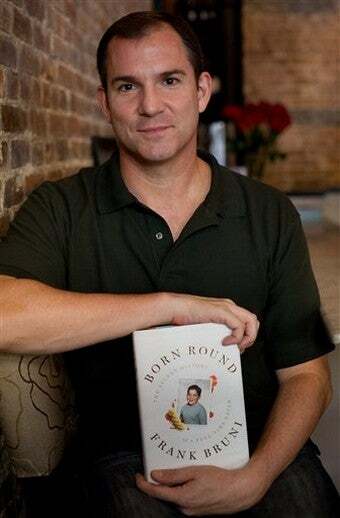 Homosexual boys were seven times more likely to binge and 12 times more likely to purge (behaviors Frank Bruni, pictured, wrote about in his book Born Round) than straight boys, with bisexual and mostly heterosexual boys facing a lesser but still elevated risk. This kind of isolation and victimization can take its toll on a young person, and one of ways it can play out is in vulnerability to eating-disorder symptoms and a host of other stress-related health problems. This is not a rare problem; it affects a significant number of schoolchildren. Studies have shown that girls who looked at these sites had low self-esteem, felt bad about their bodies and were miserable. Patients in eating disorders units spend up to 20 hours a week looking at [the websites]. There is a vulnerable group of women who are being sucked into this. Schmidt's message is important, but it leaves out boys — it now seems that gay boys and men who suffer from eating disorders are marginalized both by a heteronormative society and by a culture of eating disorder treatment and prevention that focuses mainly on women. The Royal College of Psychiatrists doesn't advocate banning pro-eating disorder websites (Schmidt says, "These sites are probably set up by people who are themselves vulnerable. Criminalising the problem would not be helpful. "), but rather asks the Council for Child Internet Safety to "specifically target pro-eating disorder websites in its monitoring and educational activities." Perhaps gay, bisexual, and, as Austin says, "other sexual-minority kids" could use specific outreach and education as well.